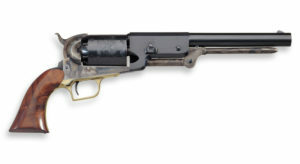 The Colt Army Model 1860 is a muzzle-loaded cap & ball .44-caliber single-action revolver used during the American Civil War made by Colt’s Manufacturing Company. It was used as a side arm by cavalry, infantry, artillery troops, and naval forces. 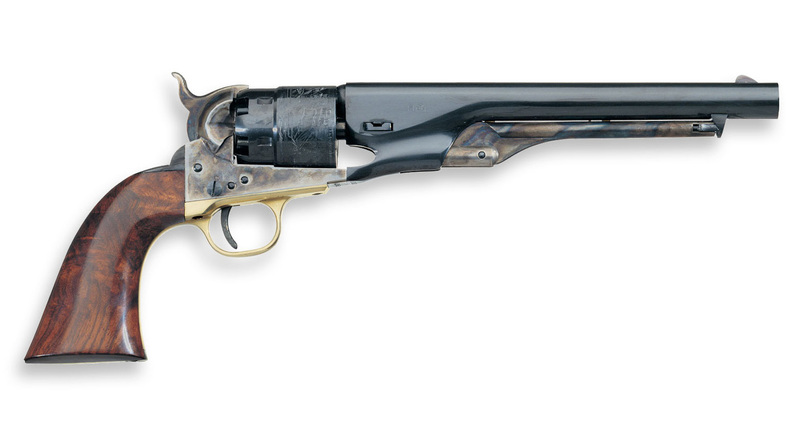 Uberti’s replica 1860 Army .44 Caliber Black Powder Revolver has a brass trigger guard, color case-hardened steel frame, round barrel and walnut grips. There’s also a naval battle scene on the cylinder. Technical: Caliber .44, barrel length 8”, overall lenght 13-3/4”.